Did anyone miss the news that many store-bought, soy-based veggie burgers have been found to contain hexane? Did we need another reason to make our own veggie burgers? I didn’t think so, but it can’t hurt to coax the flame every now and then. This burger is an admittedly kooky one. The inspiration—need I even explain?—comes from the French chef I work for part-time. He jokingly suggested beet tartare when I was coming up with recipe ideas, at which point I didn’t hear him correctly and thought he was misunderstanding the concept of vegetarianism. But when he finally got through to me, it seemed like a fun idea. To my surprise, it’s a pretty tasty veggie burger, too (though not exactly tartare, since the beets get cooked). I haven’t yet found a way around the egg whites; if anyone has a suggestion, I’d love to hear it. You can cook these in any sized heat-safe cup you have on hand—1/3 or 1/2 cup sized heat-safe measuring cups, for example, cooking the patties in batches—but a 4-0unce ramekin is ideal. 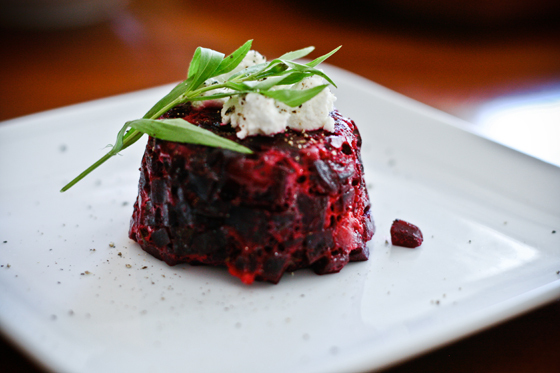 It’s also worth mentioning that beet “tartare” is the only recipe in the book that benefits from a microwave. The gist of the technique is that you cook the beets, then chop them up, pack them into ramekins with a the mild binder, cook the cups, and then pop them out. A microwave makes the cooking a snap, but if you don’t have one or are otherwise adverse to the idea, you can steam them, as explained below. There isn’t much to this recipe besides the beets, so I consider this one more of an elegant starter than as a center-of-the-plate dish. Roast the beets: Preheat the oven to 400°F. Place the beets on a square of aluminum foil and rub with the oil. Wrap tightly in the foil. Roast for 45 minutes to 1 hour, until completely tender. Cool completely. Peel the beets and chop into small dice—approximately 1/8-inch. In a mixing bowl, whisk together the egg white, shallot, vinegar, tarragon, and potato starch. Fold in the diced beets. Line the bottom of each (4-ounce) ramekin with a small circle of parchment paper. Using your fingers, grease the sides of each ramekin and its parchment with a bit of olive oil. Pack each ramekin with the beet mixture, leveling off the top for a flat surface. Depending on the size of your beets, you will have enough to fill either 5 or 6 ramekins. Cover each ramekin with microwave-safe plastic wrap and microwave for 1 minute until firmed. Alternatively, steam the ramekins: Bring 1/2 inch water to a simmer in a stockpot or saucepan with a colander or steaming basket insert. In batches if necessary, add the ramekins, cover, and steam the beet “burgers” for 3 minutes, until the mixture congeals. single patty-shaped piece. Remove the parchment. Repeat with the remaining ramekins. To serve, top each “burger” with 1 tablespoon of goat cheese and black pepper to taste. Garnish with a few sprigs of tarragon and some minced shallot. I wonder if chickpeas or egg substitute would work for a vegan version, maybe also adding in some flour/more starch of some kind to thicken it up. I’ve made beet hummus with chickpeas and let it stay chunky vs smooth. I wonder if I cooked it.. if it would do this if I added some flour & egg sustitute to firm it up. I’ve made some sweet potato muffins and used too much sweet potato that it came out like this. Or as I imagine it to be, soft, but still holding it’s shape. Soy cheese of some kind would be great to use for a topping. Sheese makes a blue cheese, (there’s 2 kinds of cheddar too & other flavours) but the texture is like cream cheese. Not like blue cheese at all in texture. Not sure if they have anything in for “goat cheese” in vegan form. For me personally, Daiya mozzarella would be a good sub in. I like mild cheeses tho. I can see a nice spicy mixed greens salad going well with this. I can’t wait to have a go with this.. looks good. ❤ this blog & beets too! I’ve used Ener-G egg replacer for many things and it works well for binding. Thank you, Michael. You’re take sounds very delicious right about now.